Do not sync with QuickBooks from multiple devices! Due to delays inherent in syncing ContractorTools data between multiple devices, there is no guarantee that the ContractorTools data will be the same in all devices at any point in time. Because of this, you should never sync with QuickBooks from more than one device! Before syncing with QuickBooks, select the device or computer that is the fastest, and has the best internet connection. Then only sync with QuickBooks from that device or computer. QuickBooks does not provide a way for ContractorTools to sync with the Self Employed version of QuickBooks Online, so ContractorTools can only sync with the Simple Start, Essentials, Plus, or Advanced plans of QuickBooks online. ContractorTools can be set up to synchronize data with QuickBooks Online. This allows you to use ContractorTools for construction specific functions, and QuickBooks for general business accounting functions, without ever having to enter data twice. 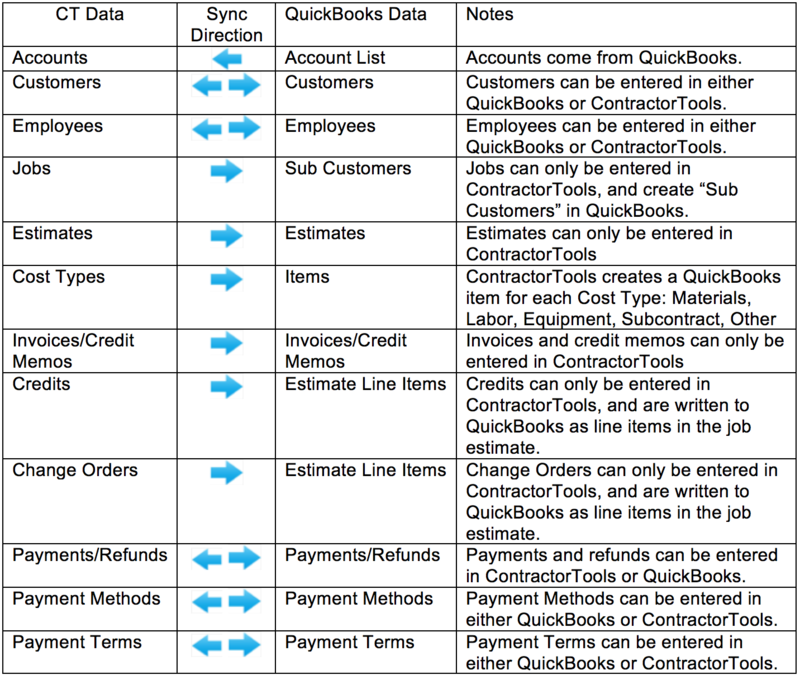 How Does ContractorTools Sync With QuickBooks? You enter all customer and job related data in ContractorTools, and ContractorTools automatically transfers it to QuickBooks. ContractorTools can retrieve customer data from QuickBooks. So, if you've been using QuickBooks, ContractorTools will automatically pull all of your customers from QuickBooks. But once you start using ContractorTools, it is easiest to just enter everything in ContractorTools, and let it sync all of your data with QuickBooks. What Data Is Shared With QuickBooks? And How? How Does ContractorTools Match Customers? ContractorTools only adds customers to QuickBooks if a matching customer is not found in QuickBooks. If a match is found, then the customer in ContractorTools is “synced with” (connected to) the matching customer in QuickBooks. When a customer in ContractorTools is "synced" with a customer in QuickBooks, that means that when you make changes to the customer in ContractorTools, those changes will be updated to the same customer in QuickBooks. So, how does ContractorTools match customers with customers in QuickBooks? ContractorTools compares the company name, and first and last name to the company name, and first and last name in QuickBooks. The customer is considered to be a match only if all of the first name, last name, and company name are the same. What Customer Data Is Shared With QuickBooks? In order for QuickBooks to provide general ledger accounting, every transaction line item has to be associated with a general ledger account. One way to do that would be to require you to select the account for each line item as they are entered in QuickBooks. Another approach is to allow you to define a list of "Items" (Products and Services) that you can use repeatedly in your transactions, and have each of the Items be associated with a general ledger account. This is what QuickBooks does: each line item (in an estimate or invoice) has a QuickBooks Item. And to provide more information about each line item in individual transactions, QuickBooks also allows you to enter an item "description". So the QuickBooks Item ties the line item to an account, and the description describes the item for that individual transaction. When ContractorTools syncs transactions with QuickBooks, it needs to associate each transaction line item with a QuickBooks Item. So it creates a separate Item in QuickBooks for each type of cost in ContractorTools: Materials, Labor, Equipment, Subcontractor, and Other. When ContractorTools writes transactions to QuickBooks, it assigns each line item to a QuickBooks Item (Materials, Labor, Equipment, Subcontractor, and Other), and it writes the item description, which is the combination of the item name and description that you entered in ContractorTools. The QuickBooks Sync Setup Prompts for Cost Accounts. Why? All line items in transactions in QuickBooks require a QuickBooks "Item" (from the list of "Products and Services"). So, to write transactions (estimates and invoices) to QuickBooks, ContractorTools needs to associate the line items with QuickBooks Items. Since every job in ContractorTools has a different set of line items, it makes no sense to write a new line item to QuickBooks for every line item in every job in ContractorTools; this would quickly create 10's of thousands of Products and Services in QuickBooks, each of which would only be used in a single job. So, what ContractorTools does is write only 5 Products and Services items; one for each type of cost, "Materials", "Labor", "Equipment", "Subcontract", and "Other". All of the line items from estimates and invoices in ContractorTools are written to QuickBooks with one of these 5 QuickBooks Items (and the item name from ContractorTools goes into the item description in QuickBooks). When you add an Item to the Products and Services list in QuickBooks, you must specify both an Income Account and an Expense (cost) account. ContactorTools assigns the same income account (selected in the "Income Account" prompt) to all 5 Items, but it allows you to specify a different cost account for each cost type. Why? If ContractorTools does not record costs, and does not write costs to QuickBooks, why does it prompt you for the cost accounts to be associated with the QuickBooks items it creates? Well, again, one reason is because QuickBooks requires a cost account in order to write the item, but the other reason is because we are planning for the future when ContractorTools will be enhanced to allow you to enter your actual costs for jobs. At that time, those will be written to either bills or purchase transactions (checks, cash, credit card purchaes) in QuickBooks. At that point, you will want the associated items to have the appropriate cost accounts associated with them. When Does ContractorTools Know It Needs To Sync With QuickBooks? Once you enter more than a few jobs and customers in ContractorTools, you can imagine that it would take a lot of time to sync every one with QuickBooks. Because of this, ContractorTools does not sync all data with QuickBooks every time it syncs, it only syncs data that "needs to be synced". How does ContractorTools determine which data needs to be synced? New customers that are associated with a job that is set to sync with QuickBooks are synced. Once a customer has been synced, it only syncs again if you change any of the customer information in ContractorTools. Note: ContractorTools cannot know if you change information for a customer in QuickBooks, so it will not know that it needs to pull changes from QuickBooks. So always update your customer information in ContractorTools, not QuickBooks. New jobs that you add in ContractorTools are synced with QuickBooks if…- The job has a customer, and - The job has been set to sync with QuickBooks. To set the job to sync with QuickBooks, tap “Job Info” in the job home screen, then turn on “Sync Job with QuickBooks”. Once a job has been synced, it only syncs again if you change any of the job information in ContractorTools. Note: ContractorTools cannot pull job data from QuickBooks; it can only write job data to QuickBooks. If you need to enter or change any job data, enter or change it in ContractorTools; ContractorTools will update it in QuickBooks. If you change it in QuickBooks, ContractorTools will re-write it (change it back) in QuickBooks. If you need to delete a job, delete it in ContractorTools; ContractorTools will delete it in QuickBooks. If you delete it in QuickBooks, ContractorTools will re-write it in QuickBooks. ContractorTools can read and write Payment transactions from and to QuickBooks, but it can only write invoices to QuickBooks. So, you can enter Payments in either ContractorTools, or QuickBooks, but you can only enter invoices in ContractorTools. New transactions that you add in ContractorTools are synced with QuickBooks. Once a transaction has been synced with QuickBooks, it will only get re-synced to QuickBooks if you make changes to it in ContractorTools. Note: ContractorTools cannot pull invoices from QuickBooks; you must only enter invoices in ContractorTools. Do not enter or change invoices in QuickBooks. If you need to enter or change invoices, enter or change them in ContractorTools; ContractorTools will update it in QuickBooks. If you change invoices in QuickBooks, ContractorTools will re-write them (change them back) in QuickBooks. Do not delete job transactions in QuickBooks. If you need to delete any transactions, delete them in ContractorTools; ContractorTools will delete them in QuickBooks. If you delete them in QuickBooks, ContractorTools will re-write them in QuickBooks. Important: Please see this article about syncing Payments with QuickBooks. Please see this article for information about how to set up QuickBooks Syncing.